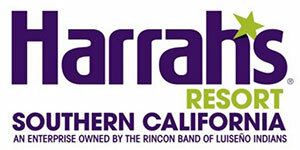 Harrah’s Resort Southern California is the largest casino resort in all of California if we judge by the number of available rooms. It was formerly known as Harrah’s Rincon, due to the fact that it was and still is owned by the Rincon Band of Luiseño Indians. However, the casino is run by Caesars Entertainment, one of the largest casino companies in the US that operate dozens of casinos throughout the US. Harrah’s Resort opened its doors in 2004, right before Christmas and it was renovated twice since then, in 2014 and 2015. The incorporated hotel is consisted of three towers and it has over 1,000 rooms. The total gaming space is 55,000 square feet large. If you visit Harrah’s Resort you’ll also have the chance to relax in the spa and play golf at the adjacent Woods Valley Golf Club. There are a number of restaurants and bars, including Earl of Sandwich, Oyster Bar, Fiore, The Café, as well as several other amenities. At Harrah’s Resort you will find over 1,700 slot machines, as well as about 70 tables. The selection of card games is pretty extensive and it includes progressive Pai Gow, Mystery Card Roulette, Rincon Craps, Asian Poker and of course Blackjack. At this casino you will find Blackjack variations played with different number of decks. The 6-deck Blackjack variant can be played with a minimum of either $25 or $50, whereas the maximum bet is $2,000. The dealer is supposed to hit soft 17, the player can’t re-split aces, but doubling down on any two cards, doubling after splitting are available and it is possible to surrender. The house edge for this game is 0.55%. The 8-deck game is very similar to the 6-deck one, the only difference is that here the minimum bet limit is $15, whereas the maximum is the same. You can’t re-split aces, but you can double after a split and you have the option to surrender. The house edge is somewhat higher, due to the fact that more decks are used, but it is still lower than 0.60%. The continuous shuffle Blackjack has a slightly lower house edge than the 6-deck and the 8-deck version. The house edge for this game is 0.53%. Plus the minimum table limit is $10, whereas the maximum limit is also $2,000. The rest of the rules are the same, the dealer hits soft 17, doubling down is available on any two cards and so is doubling after a split. You can’t re-split aces, but surrender is an option. The double-deck Blackjack is the game with the most favorable house edge at Harrah’s Resort. The rules are similar as the other three versions listed above, the dealer hits on soft 17, it is possible to double any to cards and after splitting, but you can’t re-split aces nor surrender. The house edge for this game is 0.40%. The table limits are the same as the ones for the 6-deck game, the minimum is either $25 or $50, whereas the high limit is $2,000. Single-deck is the most popular variant among card counters. Harrah’s Resort remains one of the casinos that offers single-deck Blackjack. The rules are the same as the ones for the double-deck version, the dealer hits on soft 17 (that’s the case for any game at this casino), you can’t surrender or re-split aces, but you can double down after splitting and double on any two cards. However, the Blackjack pays 6:5 here, which increases the house edge significantly, up to 1.40%. The good thing is that the minimum bet here is only $10, whereas the maximum amount that you can wager is $500. The best game if you’re counting cards at Harrah’s Resort in Southern California is definitely the double-deck Blackjack game. The house edge is pretty low and the dealer penetration can be quite favorable. The only problem is that it is not consistent, different dealers offer different deck penetration and often it may vary even with the same dealer. If you plan on counting cards, it’s perhaps best to stick to the double-deck game. Harrah’s Resort is not only the largest resort in Southern California, but in all of the state and it definitely won’t disappoint you, regardless whether you’re vising it just for fun, or you aim to make some money. There are a lot of things that the players can don when they’re not at the Blackjack table, and one thing is certain, nobody got bored at Harrah’s. The Blackjack games have reasonably low house edge and the limits are standard.